Your group of 8 will be based on GP and then who you face (after the first round) is determined by your win/loss record within that group. For example, everyone in your group has around 1mil GP but you lose your first round, you will then mostly go up against other players who lost their first round. Sigh...Crumb we've been saying GP alone is not a sign of a roster(whether personal or guild) in all the matchmaking topics. Did you really not take notice? At least thanks for clearing it up. Given the Grand Arena is a week long affair, I have a question about whether we're getting "more" content, or "different" content. I don't need to know a locked down schedule and frequency. But is the intention for this to be separate from the Territory War/Territory Battle schedules, meaning these could overlap - or will our months now be split between these three type of events. I think there are people on both sides of the coin for this one. I know this isn't a "guild" event, which would lead me to believe it's separate - but worth checking in on it since there have also been posts about time investments per day and trying to keep the requirements limited. If these types of events will overlap, any near future plans for some additional QOL time saving updates - 6x or 8x (I'd recommend making these auto-only), or maybe some sort of farm planner where I can designate nodes are my priority farms for a single click auto using all available energy? @No_Try don't know if we will ever know the truth of it but the most recent TW I looked around to see as many results of the DSR guild comparison bot as I could find and the parameters that seemed most similar across all of them seemed to be GP, number of zetas, number of g11 and number of g12. (active GP in the case of guilds and only including characters above 6000 presumably). I don't desire to know to the exact weighting in the calculation, just was hoping there was a smarter calculation like you mentioned. But Crumb cleared it up but saying it's purely based on GP. Wait wait! Let me get it first! CG_SBCrumb It is also possible to complete it with regular arena battles. AWSOME another client restart to cheat people out of tb points!!! why more of the 24h phase cr.p? What’s wrong with 24 hour phases? It’s a global game. Have to give everyone an opportunity to play. Gave then too much credit thinking GP was going to be a part of the equation. Wish it was a complex matchmaking structure rather than simple. It sounds like 8 players will be matched up based purely on GP. First round will be four random matchups. At the end, you'll have 4 winners and 4 losers. The second round will have two matches of Winner vs Winner & two matches of Loser vs Loser. After 2 rounds, you'll have two players with a 2-0 record, 4 players with 1-1 records, and 2 players with 0-2 records. The 2-0 players will match up, the 0-2 players will match up, and then the 4 players with 1-1 will pair up. So yes, it's possible that you may end up in a bracket with someone whose roster is much better than yours - and also some players whose rosters are much worse than yours. 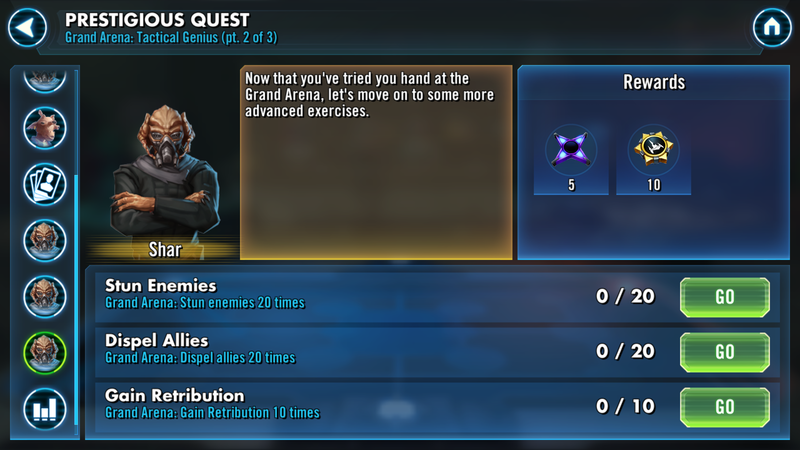 @CG_SBCrumb What will happen to those players that were able to complete some of the quests already for the Grand Arena? Is this getting reverted back or will they remain in place? To me, this sounds more like Squad Arena then Territory War. I am not a fan of Squad Arena at all. I forfeit every day. Is this new mode something you have to sign up to be interest in joining the next one? Because I don't want to take up a space in a mode that I don't want to play because that isn't fair to those who DO enjoy those aspects of the game. Looks like you would have to sign up for it like TW boba so if dont wanna participate dont have too. @paulbacon the raid part was a fix, on occasion before nihilus could get bugged. Wonder which character logo I should choose? Will reducing our GP artifically impact our GA matchmaking? Thank you for the payout time change! Best QOL update yet! I do have a question though. I just changed my payout time, and I see that I have 1 more change in the next 365 days. If I use it at the next daylight savings start (March 10 for me), then I will be out of changes and will not be able to adjust it when daylight savings ends (November 3) but I will instead have to wait until December 4th. Is that correct? If so, could we have this first time frame shortened to something like 300 days, so that those of us who want to keep our payouts consistent with local time can do so? The title update is not showing in the Google Play store for me and I am on Android. Is anyone else still not seeing it? GP would be screenshot at time of joining just like TW they said so yes effectively lowering you gp before joining would. Although changing your gp enough to make a difference would require removing mods so I wouldnt suggest it.